Since we had already been to Japan twice in a row, I thought that we’d probably not be going again for a while. A few months after coming back from our last trip we started thinking about when are where we’d go for our next trip. Since there were still plenty of places in Japan we had yet to visit, and because we had such amazing times there in the past we somehow decided to return to Japan. We had a bit of trouble with our leave since we wanted at least three weeks over there but did not want to visit during Tsuyu (Japan’s fifth season- the rainy season), which takes place during June, or during their summer (July-August). We also had to wait for a Jetstar sale which would let us buy tickets at around $500 return instead the non-discount price of around $1000. After a bit of mucking around we both managed to get three weeks off in May (leaving one of us in negative leave). At about the same time we also booked flights from the Gold Coast to Narita (Tokyo) and then from Kansai (Osaka) back to the Gold Coast for $561. I had a lot of difficulty doing this at first until I realised you're supposed to use the multi city option. While we were booking I paid an extra $5 to upgrade my checked luggage from 20kg to 25kg on the flight home as I wanted to bring home some more books. We booked our flights to fly out on Saturday and return home Sunday morning to maximise our time in Japan. A couple of days after we booked our main flight Jetstar announced that they were expanding their intra-Japan network and were selling a select number of seats for only ¥5 each. That's like five cents! Unfortunately their website crashed when the sale opened and I wasted an hour trying to book a flight from Nagoya to Fukuoka. However! Due to the kerfuffle Jetstar extended the sale for another few hours and I managed to get one of the super cheap flights! After adding ¥300 for taxes, a ¥200 booking fee and ¥1100 for 20kgs of luggage the fare came to ¥1605 each (about $16)- pretty cheap for a 1h 30m flight! Next we had to work out our itinerary! The areas we wanted to explore were the Japanese Alps in central Honshu as well as the other main islands of Shikoku and Kyushu. Unfortunately, try as I might, I just could not manage to squeeze in all that we wanted to do. This was partly due to the flight and partly due to not having enough days. A few times I thought I had it worked out and then realised I had doubled booked our days. 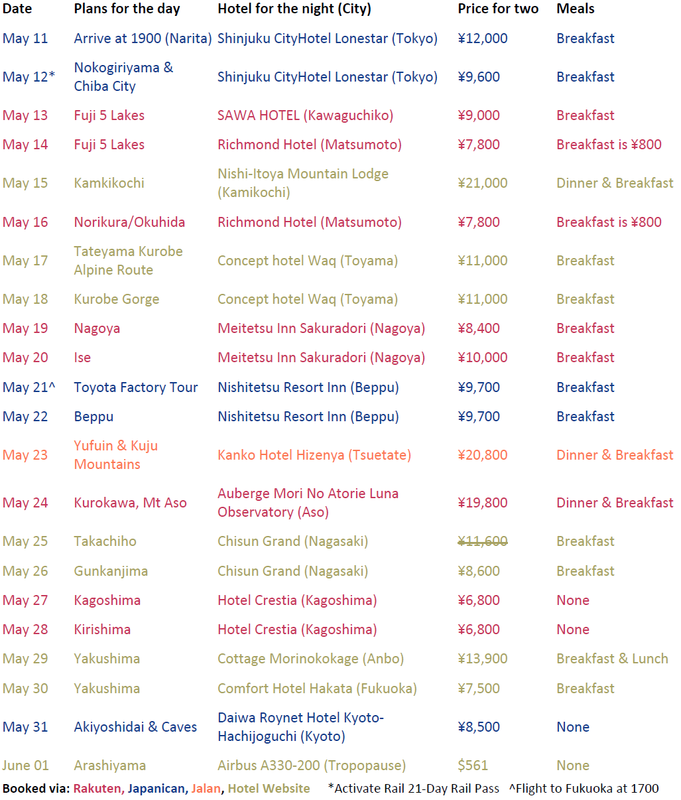 Anyway, after lots of consideration we made the hard decision to cut Shikoku and with some help turned our rough itinerary into something more concrete. We planned to spend three days around the Kantou region, four in the Japanese Alps and two days in Nagoya with a day trip to Ise. On our last day in Nagoya we planned to fly to Fukuoka and then catch a train to Beppu which we’d then explore the next day. Following this we planned to hire a car and drive along the trans-Kyushu route visting Yufuin, Mt. Kuju, Kurokawa, Mt. Aso and Takachiho with an overnight stay in Kurokawa and Mt. Aso. At the end of the route we’d drop off our car in Kumamoto and catch a train up to Nagasaki, go on a tour of Gunkanjima as well as explore the rest of the city. Next we aimed to catch the shinkansen down to Kagoshima and spend one day exploring the city and another hiking in Kirishima. From Kagoshima we then planned to take a jetfoil down to Yakushima, spend a night there and then make our way back up Kyushuu to Fukuoka. The following day we aimed to explore the Akiyoshidai plateau and caves before returning to Kyoto where we’d spend our last day. A visual representation of our planned route. The numbers refer to what order we planned to overnight in each place. 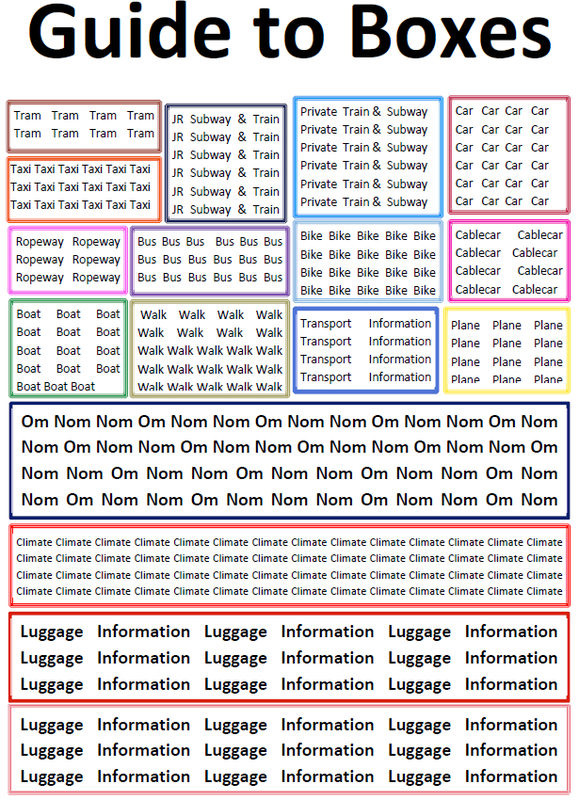 With our itinerary sorted out our next task was then to work out what transportation passes we might want to get (E.g. Japanese rail pass, Kyushu rail pass, Kanto pass etc). Unfortunately we required a lot of transportation on non JR services and were covering quite a large area so it was a little difficult to try and find the most cost effective solution. After a lot of intense excel spread sheets we decided to get the 21 day rail pass- it only just paid off by about 200 yen but the convenience, flexibility and lack of guilt (should we go to x- oh but it’ll cost $40 etc) it provides sealed the deal for us. As usual we ended up making a few trips we didn’t strictly plan for so it actually ended up paying off quite well. After having our confidence booking online shattered last year we decided to try a travel agent and managed to get them from a flight centre for only $575 each after a price beat on an online price of $576. Considering the RRP is ¥57,700 and the AUD/JPY rate was around 96 at the time- it was a pretty good deal. Most other prices we found were around the $600 point. It was still a pain to actually get the pass though- travel agents never seem to follow through unless you nag them. Next it was time to book the hotels! 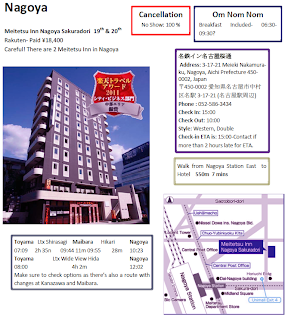 We always find it a little stressful booking hotels and had particular trouble trying to find something suitable in Kamikochi, Fuji 5 Lakes, Kurokawa, Mt Aso and Yakushima. In fact we had so much trouble finding something cheap enough in Kurokawa that we actually ended up booking a ryokan about half an hour’s drive away in the town of Tsuetate. Despite this it was one of the most expensive nights at ¥20,800- although it was certainly good value considering it included dinner and breakfast. Speaking of meals, when we were booking our hotels we did our best to select hotels and options that included breakfast. We hadn’t done that in the past but had stayed at a few that just happened to have breakfast included anyway and found that it was much easier to have breakfast at the hotel rather than going through the hassle of trying to find something in a unfamiliar city. Well, as long as breakfast opened early enough (6:00 – 6:30am). Though it wasn't a factor in deciding the hotel, we opted to make an advance payment on our credit card if we could. All of the transactions were in yen and I used my 28 degrees master card (as it doesn't charge an exchange fee). You can have a look at the previous post to see what we did in terms of payment on arrival and payment in advance- it ended up being about 50/50 in terms of nights. We haven’t actually been charged for our Tsuetate Hotel yet and I’m not sure if it’s due to a mistake or if it’s just taking ages to process. We booked over two months ago now. I remember the first time we prepaid with rakuten we were a bit worried none of our booking worked since they all dropped off our credit cards after a long fund hold period. When we contacted them though we found out that they did this on purpose so they could charge everyone at once every two months. I have no idea why. Probably because of this they don’t (or didn’t) let you make any booking with a debit card, only credit works. If the Tsuetate charge is going to go through I hope it’s soon since the AUD is dropping a fair bit lately and I don’t want to be charged a whole lot more than we were expecting. Anyway, once we’d reserved our hotels we used Tocoo to book the three rental cars we planned to hire. We decided on JR Ekirentacar at Beppu for three days with a drop off in Kumamoto (¥20,500), Budget Car rental in Kagoshima for one day (¥4,365) and Times Car Rental (Mazda) for two days on Yakushima (¥12,000). We wanted to go with a cheaper place on Yakushima but couldn’t really find much close to the port we wanted to arrive at. Especially since I didn’t really want to try ringing up and booking any in Japanese. Once the cars were booked there were just a couple of extra things to go like booking the Toyota factory and Gunkanjima Island tours. There were a few things we decided not to book right away (Kurobe Gorge Railway, Yakushima Jetfoil) as we could pay on the day and we could check how full they were on the website. The plan was to keep an eye on how busy they were getting with an intention to book if we saw them filling up. For internet connectivity we decided to go with pocket WiFi (instead of a data SIM like last time) and choose a ¥10,200, 42MBPS Global Advanced Communications device. Ohh and we had also organised travel insurance earlier with Ouch! We haven’t claimed anything so I don’t know how good they are. Next to organise was our guide book AKA The Japan Book! I actually intended to make it more streamlined and concise than last time as I think I spent too much time researching and including information on things we could do (or even couldn’t really), rather than things we probably would do. For some reason though the book ended up reaching 253 pages long- which meant I had to split it up into two volumes. It was invaluable during our trip and I’ll give a bit of a rundown of the design since I didn’t really explain it very well last time. The general aim or philosophy was do as much of the research required as possible before the trip so we wouldn’t for example waste time wondering what bus to catch and when it comes. Even if it would only take a minute to work something out in Japan it might be worth spending ten minutes working it out now as that minute is a much more valuable holiday minute. It might be the difference between making or missing a connection. Plus time in Japan is more fun than most of what I’d be doing at home instead. I also attempted include things that might not be on a traditional itinerary or that required a bit of planning to work out. In terms of design I tried to make it as information dense and organised as possible while also including many photos – preferably one or two for each entry. This meant that the writing was quite small (when printed in A5 size) and timetables a mass of numbers. The vast majority of the Japan Book is made up of different sections representing a city (e.g. 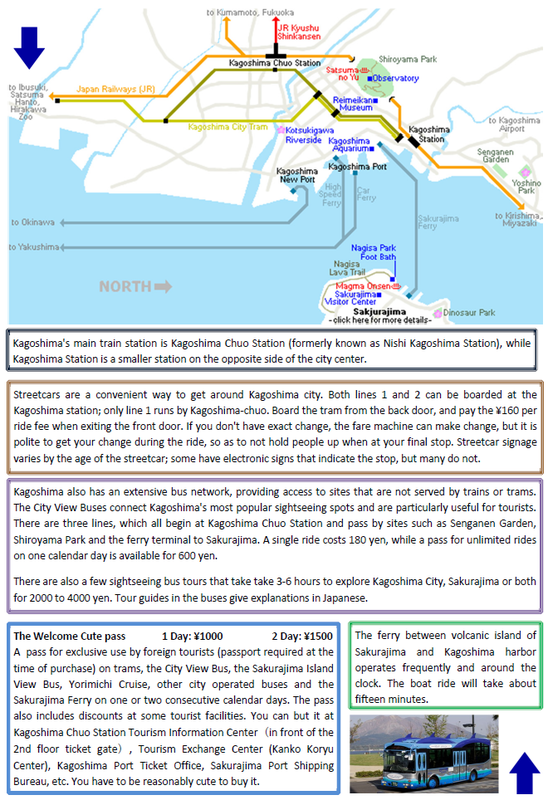 Kagoshima) or general area (Yakushima) that we planned to visit. These sections would then contain a separate mini-entry for each attraction. The beginning of each major area/city section would have its name at the top in kanji with the rōmaji (i.e. name in English in most cases) written underneath. I’d then have a big colour photo that would take up around the page- in most cases I’d try and get a wide shot of whole place, if this wasn’t possible I’d settle for something iconic or representative. Under the photo I’d put in some text that would give some context and history on the place. 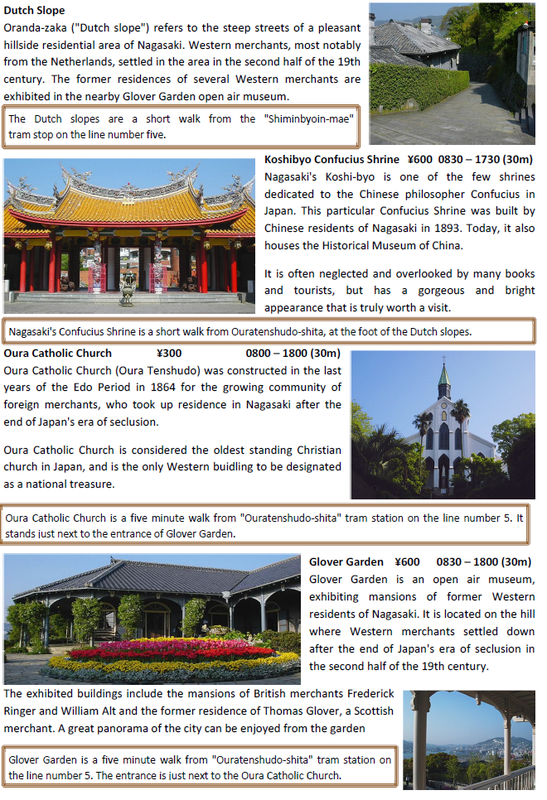 This information was mostly adapted from Japan-Guide, Wikitravel or Wikipedia. Also on the front page below the photo I’d have a timetable(s) detailing how to get to the city from where and when I expected we’d be. 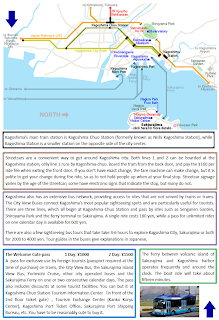 In order to save space I relied heavily on colour coding both to indicate the type of transportation (shinkansen, car, bus, boat) and to highlight information within the timetable (type of train etc). 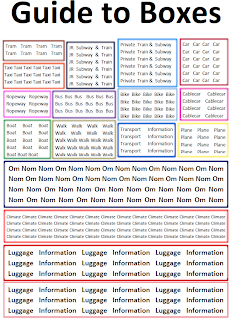 If specific information was not available or unreasonable to include (trains every 2mins, taxi/walking information) the timetables would include broader information written in short sentences. 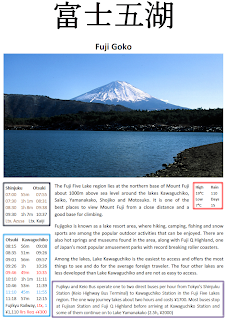 For the general information I was able to use sources such as Japan-Guide and wikitravel and hyperdia was invaluable for looking up specific train times. In cases such as a bus or a boat I had to look at the operator’s website to get the times. Doing this I noticed quite a few times that often the English versions of websites were hopelessly out of date and so I had to make sure to use the Japanese versions. After that first page I’d have another page or two with information and a map on how to get around the area. Much of this information would be taken from Japan-Guide or Wikitravel with the Japan-Guide maps being particularity useful. Next came the actual entries on things to do, at the top I’d have the name, price and opening times in bold font with some descriptive text underneath. I’d make sure to include photos with the intention to have a 50/50ish split between photo and text. This would vary greatly though depending on the space, text and photos available. I’d also make sure to include information on how to get there. The level of detail here would depend on how likely I thought it would be that we’d actually go. At the end of each area section, or wherever I found space, I’d include boxes with information on local culinary highlights- these were called the “Om nom nom” boxes. At the end of each book was the hotel section that had information on what we booked, if we had to pay and detailed instructions on how to find each hotel. 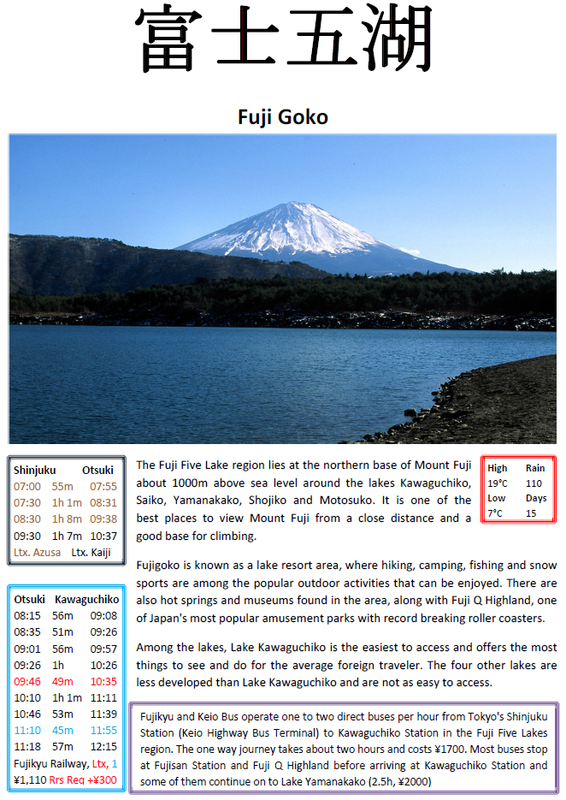 Finally, I had also included some reference pages and a bit on how to drive in Japan. Once the Japan book was created we took it down to Officeworks and had it bound. Unfortunately due to some incompetence on their part the pages in first volume got all mixed up. Since we didn’t have time to redo it we had to decide to just deal with it. As with last time I bought my HTC One X mobile phone, an old eeePC netbook and my old GPSr. As money I brought along my 28 Degrees MasterCard, a Citibank Plus (VISA) transaction account card and about ¥10,000 in backup cash. For taking photo’s I brought along my Panasonic Lumix TZ7 compact digital camera- which I used to take photos during our previous trips. After we arrived I discovered to my dismay that at some point it had got a horrible scratch chip chasm in its lens. This made it very hard to take photos of certain things. To make matters worse, Kate’s camera (also a Lumix) was also on the fritz with its LCD backlight display going dark for the last time on the fourth day of our trip. The rest of the camera seemed to be working fine but when she wanted to take a photo all she could really do was point (in the general direction) and shoot. I pointed out that the Apollo astronauts faced the dilemma and their photo’s turned out alright- so she’d better make sure she got some good ones as well as my camera was also awful! Luggage. As always I bought too many clothes, but less than the previous time. Too many shirts, not enough pants. My luggage is a soft 76 x 50 x 34/38cm two wheeled antler suitcase- Kate’s is similar. We also both brought along a medium sized backpack for overnight trips and a small backpack for using during the day. One final thing I want to mention is that while travelling, especially in Japan, we always seem to end up with heap of pamphlets, tickets and papers from the places we’ve visited. Last time we thought they’d weigh us down so we ended up discarding most of them as we went. This time however I collected them all up and brought them back with me, and it’s a good thing I paid for that extra baggage as they weigh over a kilogram! Full disclosure: I work at JTB Australia as a web minion. "Since we had already been to Japan twice in a row, I thought that we’d probably not be going again for a while. We see this a lot here. We have heaps of customers who have been to Japan multiple times. I spoke to one of our customers in the lift (they don't let us web minions get much sunlight, let alone face-time with customers, lol) and he was on his fifth trip! 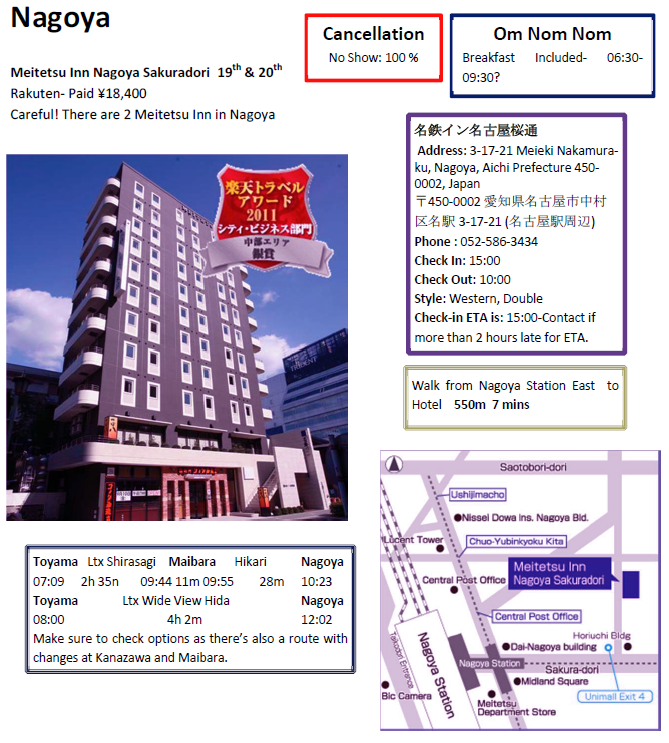 "After a lot of intense excel spread sheets we decided to get the 21 day rail pass- it only just paid off by about 200 yen but the convenience, flexibility and lack of guilt (should we go to x- oh but it’ll cost $40 etc) it provides sealed the deal for us." JTB applauds your wisdom! More seriously though, we love selling the JR Pass because it's just a great money-saver almost all of the time. I don't want to sound too biased but we rarely have a case where it's not a good idea to get one (unless it's Tokyo to Kyoto ONLY, which is something we don't see very often, or some other similar cases). "When we contacted them though we found out that they did this on purpose so they could charge everyone at once every two months. I have no idea why." I used to wonder about this as well but then I was at a talk recently given by a mobile payments provider (Braintree) and they mentioned that there's a lot of rules that come into play when you pay for something in advance but don't receive the product immediately (travel and magazine subscriptions are the examples they gave). If you pay for a 12 month subscription and then the magazine folds (no pun intended) after one month and declares bankruptcy, the bank is then on the hook for your refund! So maybe that has something to do with it (not saying it does, but maybe it's connected to it somehow). I think it's called "Forward Debt Risk" or something like that. Just my guess though. "For some reason though the book ended up reaching 253 pages long- which meant I had to split it up into two volumes." "Even if it would only take a minute to work something out in Japan it might be worth spending ten minutes working it out now as that minute is a much more valuable holiday minute. It might be the difference between making or missing a connection. Plus time in Japan is more fun than most of what I’d be doing at home instead." Absolutely. I'd also add that one of the often overlooked benefits of planning is it (paradoxically) gives you the ability to be more spontaneous. "Unfortunately due to some incompetence on their part the pages in first volume got all mixed up. Since we didn’t have time to redo it we had to decide to just deal with it." Hope you had page numbers! "One final thing I want to mention is that while travelling, especially in Japan, we always seem to end up with heap of pamphlets, tickets and papers from the places we’ve visited. Last time we thought they’d weigh us down so we ended up discarding most of them as we went. This time however I collected them all up and brought them back with me, and it’s a good thing I paid for that extra baggage as they weigh over a kilogram!" Same happened to me five years ago (was it really that long ago?) when I did a trip to Nepal. I then used all those pamphelts, nick-nacks and photos I took to create a scrap book with stories written in it of all the stuff that had happened and gave it to my mother (she's an author, BTW) and to this day she says it's one of the best gifts she's every received. Awesome post, all-in-all. I think it would be useful to provide the Excel spreadsheet for download (if possible) as I have no doubt there are other travellers who would find it useful. Forgot to sign off properly (and there's no ability to edit my last post). Thank you for taking the time to write such a detailed reply to my post! "We see this a lot here. We have heaps of customers who have been to Japan multiple times. I spoke to one of our customers in the lift (they don't let us web minions get much sunlight, let alone face-time with customers, lol) and he was on his fifth trip!" Yeah, you just can't cover off everything at all in one trip! Every time we go we realise how much we have to miss. "JTB applauds your wisdom! More seriously though, we love selling the JR Pass because it's just a great money-saver almost all of the time. I don't want to sound too biased but we rarely have a case where it's not a good idea to get one (unless it's Tokyo to Kyoto ONLY, which is something we don't see very often, or some other similar cases)." Some people can be silly with JR passess (using them mainly within cities) as well. We couldn't actually find huge value out of it when calculating it out though the convenience is fantastic. You don't have to debate if it'll be worth trying to make something on the train. Wish we could get Mizuho and Nozomi though. JR East are not stingy with the Hayabusa. "I used to wonder about this as well but then I was at a talk recently given by a mobile payments provider (Braintree) and they mentioned that there's a lot of rules that come into play when you pay for something in advance but don't receive the product immediately (travel and magazine subscriptions are the examples they gave). If you pay for a 12 month subscription and then the magazine folds (no pun intended) after one month and declares bankruptcy, the bank is then on the hook for your refund! So maybe that has something to do with it (not saying it does, but maybe it's connected to it somehow). I think it's called "Forward Debt Risk" or something like that. Just my guess though." Yeah I'm not sure, it doesn't seem to depend on when we actually stay though- plus they loose a bit by not having the money (interest) and I could max out my card, cancel it etc. When I rang up two years ago about it they mentioned something about saving on paperwork or payment fees. I have no idea. FYI it's gone through now. "Absolutely. I'd also add that one of the often overlooked benefits of planning is it (paradoxically) gives you the ability to be more spontaneous." Yeah I definitely agree. It's much easier to be spontaneous and adapt to situations if you know you're options. "Hope you had page numbers!" It only affected a few days though at least. Book 2 was completely safe. "Same happened to me five years ago (was it really that long ago?) when I did a trip to Nepal. I then used all those pamphelts, nick-nacks and photos I took to create a scrap book with stories written in it of all the stuff that had happened and gave it to my mother (she's an author, BTW) and to this day she says it's one of the best gifts she's every received." "Awesome post, all-in-all. I think it would be useful to provide the Excel spreadsheet for download (if possible) as I have no doubt there are other travellers who would find it useful." Hmm. I'm sorry to say while it made sense at the time the spreadsheet is now complete jibberish to me. It's just a mass of numbers with a confusing layout. I do have a google earth file of all the places we hoped to visit! Might be able to share that. love these write ups, good stuff. Thank you incredibly for your comment! Wow, thanks for putting together such a detailed overview of your trips to Japan. I am currently doing some research into japan as a possible family trip option for 2015 so your information is invaluable! Thank you for taking the time to write a comment! I'm really glad some of the information and experiences I've shared are useful- thank you very much for reading! Japan's a fantastic country to travel to, I'm sure you'll have an absolutely fantastic time if you decide to go! If you have any questions about anything feel free to ask as well. Great blog! You really put a lot effort in writing this blog.. A lot of details, wonderful photos... Love them! Hats off to you for manage to complete your japan trip blog. I'm also writing a travel blog and I know it's not easy to write such a details like your blog. I'd been to Japan last November and until today, I only manage to write 2 days out of 10 days trip.��. I'll be going to Japan again this October. Your blog is indeed very useful in planning my next trip! It was definitely a huge struggle to complete it but comments really make it worthwhile! I read your blog- thanks for sharing, it's always nice to read other peoples reports of places you've been to and see the differences and similarities in experience. It looks like you had a great time and I'm sure you have another fantastic trip in October! Thank you once again for taking the time to leave a comment! This is great! I have been tossing around doing something like this and now you have completely convinced me. Great post.